I attended a gdc lecture today called making Starcraft 2 an eSport. I arrived early and saw Dustin Browder just chilling at the front of the room. So I walked over and told him I love Starcraft and asked him some questions I will write below.! Question: Who is your favorite SC:BW player? Browder: I do not have one. Question: Who is your favorite SC2 player? Question: What is your favorite race? Browder: I am a diamond league player but I do not have a favorite race. I am not allowed to have a favorite race. This being the case, at the office and in our tournaments I am only allowed to play random. This makes it hard to be good at any race because the game is so complex. Question: Will there be a SC2 tournament at next years GDC? Browder: I actually think that would be an amazing idea and will be suggesting it to the director of GDC later today. 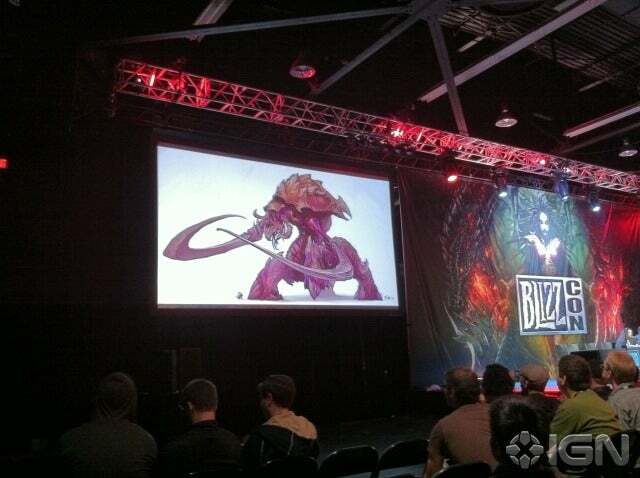 Question: What is the current status of Heart of the Swarm? Browder: We are about a year away from completing the game. Making the game to fit an eSport makes it difficult to make interesting campaigns while keeping the game balanced. Question: Did you know the mother ship would not be used by the pros? Browder: From an eSport stance, I knew right away and hated the idea of the mothership. But the mothership is badass and thought it would be a great unit for non serious gamers to have available. But recently I have seen the mothership in play more and this makes me very happy. Question: Why is the ultralisk smaller then it was in beta? Browder: The artists hated me for making such epic units such as the Ultralisk so small. But in order to make SC2 an eSport, the units in the game needed to be scaled down. Large sizes make it hard for the audience and the gamer to see whats going on. The original size of the ultra used to be able to hide 20 lings under it. Question: Why is the most broken strategy of all time, zerg rush, still in the game? Browder: Because we want the player to be on their toes from the start. It's important to be engaged from the beginning of the game. Question: How do you feel about leaving Goliaths out of multiplayer? Browder: Goliaths are an awesome unit. However, we decided that the Thor should be given a chance. I still do not know if I regret this decision. Question: What about the other units from WoL? Browder: I really liked the units from the story. However, in order to make a good eSport we had to cut out the units. The diamondBack took away from the uses of the Maurader and Tanks and the Specter was to much of a clone to the ghost. Browder: I really was against making a game that only had roughly 14 units per race and that some of them would be reused from SC:BW. Coming from a CnC background, I always believed that the more units the better. Blizzard has taught me that an eSport does not need a 100 units to make the game good, but a good balance of less unit types. This allows players to be able to scout correctly and be able to react accordingly. Browder is an amazing guy and hearing his speech was the best part of GDC! I really hope SC2 is brought to the conference next year. I hope you all enjoyed the read!!!!! edit: moar questions i forgot to add! I was reminded when a post complained about maps. Here's what he said. Question: How do you plan on dealing with tournaments for people of different skill level? Browder: Well, in the various football leagues they make it easier to play at different levels of the game by having a different set of rules. Unfortunately, we can't just give the marine +60 hp for Bronze level players. The way we are going to solve this is by releasing a new set of tournament maps that are specific to each league tournament. In bronze league tournaments, these maps will have more destructible rocks so the player has more time to build without the threat of cheese. But we aren't only focusing on Bronze league maps. We want to release maps specific to each league. We are currently preparing new maps to be presented into the Pro tournaments as well. I am hoping that the new release of these different map styles will help facilitate the level of play for each rank of Starcraft 2 Players. Apparently many of you got upset at the legitimacy of the interview. I wrote those very quickly because I went to a dinner that in fact was with several blizzard employees on top of other professionals. Let me state this clearly. I was with him before the speech. We talked and made note of things he said. I then also recorded the important information from his speech and was one of many people to ask questions from the audience. I assure you my facts are genuine. I will however apologize for making the mistake of putting "me" instead of question since not all questions were mine and in fact some where ones he asked outwardly and then answered himself. I did not expect people to be offended by the format of this post. I meant only to bring information to the table. I proudly told him I was a TL member when we met. On the issue of maps. I said nothing about new maps being brought to ladder. He stated in such a way, that if there are tournaments for people at different levels of skill, that there will be map specific pools for those tournaments.. Sorry again for anyone offended. My goal has always been to contribute to the TL community please don't knock me for the way I convey information. It was very hurried. I hope this clarifies things and yes that picture is legit. Awesome pics & questions... thanks for sharing. i love that response: "Not allowed to have a favorite race"
Browder & Blizz get too much flak around here, but I guess thats just because we as players are so passionate about the game. Me: Who is your favorite SC2 player? Browder: I am a big fan of Micromanagement. I was able to watch a lot of Beta SC2. At that time I became a big fan of TheLittleOne and also really like MarineKingPrime. In all seriousness, awesome job man. Good stuff! To Skeleton King: "Have you considered employment at Apple?" Me: Why is the most broken strategy of all time, zerg rush, still in the game? All in all, great interview and thanks for the interview with the Goliath himself. I live minutes away from the center and I wish I had the chance to go. Stick a fork in those buns. Browder actually sounded intelligent and "correct". Known Aliases: Tyragon, Valeric ~MSL Forever, SKT is truly the Superior KT! I want goliaths in SC2 in next expansion. Some really surprising answers here. We all hate on him for his CnC background, especially when the mothership is discussed. Interesting to note he hated the idea of the unit in general, and also interesting for him to note what he has learned from Blizzard, not only about the concept of Esports but also towards the number of units and balance. too bad you didn't use neural parasite on him and convince him that no more balance patches are needed right now, and what the community really wants is decent maps for which to balance the game around. xO-Gaming.com || [xO]TheGiftedApe.364 || xO-Gaming Manager. And maybe regretting the thor... interesting. Instinctually I would have thought about other units to possibly feel bad about, buy hey. Wow a diamond player... That is really, really REALLY bad. When they see MC Probe, all the ladies disrobe. Prob the only interview of Dustin ive actually liked. Ive had a very biased/skewed view against him. But I did enjoy some of those answers. Mate, you're exaggerating just a bit there. Diamond players are not that bad. Thanks for the interview OP.